Those are the opening lines of the famous song by Jacques Brel in David Bowie’s translation. They are characteristic of Amsterdam  and, of course, at the same time they are not. Amsterdam, a modern city with all the problems, opportunities and, above all, its special aspects, is one of the smallest ‘world cities’. Some 170 nationalities make up its 750,000 inhabitants. Amsterdam has vast resilience. Even after the murder of Theo van Gogh (November 2004) the situation did not escalate  although it all but did. It caused a justified outrage and led to a greater gap between different groups of inhabitants, between the Muslim communities and other groups. Even if the Muslim community condemned the murder at once, it clearly caused much distrust. In a common effort all city politicians (Aldermen, members of the city council, civil servants, myself) left their offices to go to the people  to all of them  and speak with them and listen to them and to persuade them not to make things worse by reacting aggressively. And so we saved the moment. We intensified existing contacts and made many new ones. We have tried (and are trying) to be even more alert to securing opportunities for all to participate socially and economically in Amsterdam society. In practice this means we try very hard to help the young to find and finish the right educational program and to provide opportunities to get work experience and  eventually  a job, so that they can earn money and have a respectable life of their own. And at the same time we are taking firm action against intolerance, discrimination and radicalisation. We are also doing our very best to make sure everybody receives a share of the benefits that our society has to offer. All groups in Amsterdam are being taken seriously in their lifestyles and participation in Dutch society. These goals may be ambitious and may sometimes end in failure, but so far they have proved to be a decent recipe to prevent aggression, riots or worse. My personal ambition, which should be the ambition of every mayor, is to keep all groups and all other stakeholders in the city together: inhabitants, companies, shops, those who work here, youth, tourists - everybody. This has nothing to do with passivity  on the contrary, nothing is harder to obtain. In a city everybody has plans of their own, their lifestyles, their ambitions. How do we deal with the people who like to party living next to people who hate noise? How do we satisfy a Muslim community wanting their own mosque, complete with a 40 metre high minaret in a neighbourhood where no high buildings exist and people want to keep it that way? How do we find a way to involve second-generation Muslim youth in society? How do we find teenagers a place of their own  where they can behave safely as teenagers  without scaring other people? How do we secure sufficient care for those who need it? How do we secure enough safe areas for children to play, and at the same time facilitate car traffic? How do we prevent traffic congestions and make the city more attractive to the companies that provide employment? How do we keep the city safe without putting a policeman on every street corner? None of this is new. These are the issues faced by every city. Despite the economic recession of the past years, everywhere in Amsterdam building activities are underway. It is a sign that the city is as popular a place in which to live and work as it ever was, with people both from Holland and abroad. The high-speed rail connection to Paris and London will be completed in 2007. The thoroughly renewed Rijksmuseum will be opened in 2009. The southern waterfront of the IJ-river in Amsterdam-Centre will be completed in 2010. The new residential city area built on artificial islands in the water north-west of Amsterdam will be accomplished in 2012. Finally, in 2014, the new underground railway line between the city centre and the World Trade Centre near the airport will be opened. 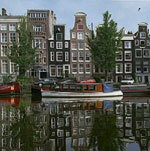 Amsterdam will then be able to unveil its new-acquired beauty to the world. With the new group of young aldermen (in place since May 2006) we are very keen to keep up the pace so as to offer all inhabitants the same open, attractive and international city after 2015. One can rightfully call this strategy a metropolitan one: enlarging the central urban area and taking advantage of the immediacy of the international airport. New concentrations of hotels, art galleries, restaurants and congress facilities between the Museumplein  with the Van Goghmuseum, the Rijksmuseum, the Stedelijk Museum and Concert Hall (Concertgebouw) the main culture zone of the capital  and the arterial road to the airport, called southern axis (Zuidas) with the huge and ever growing new business centre. In the historical city centre museums, libraries, archives and university institutions will gradually replace offices. More and more the historic buildings along the canals, with their hidden gardens and courtyards, will accommodate housing, creative activities and top segment retail shops, which will lead to a new mix of all these functions. This transformation is well underway. The leisure industry will be concentrated (possibly) in the area between the new Ajax football stadium (ArenA) and the historic city centre. These locations are already very well connected to each other by metro and are easily accessible from outside the city. The mix of living and working we already have along one part of the IJ-river waterfront may be extended both to the western harbour zone and to the east with its broader waters. These areas may be made accessible by new ferries and small boats, as a result of which lively shipping traffic will arise on IJ-river, which in turn may prove a proper location for a cruise hub. Eventually the Amsterdam IJ-river shores may grow to become the largest revitalised waterfront in the world. Amsterdam will once again take its name as the ´Venice of the North´. At the same time we want to cherish the unique qualities of the Dutch polder landscape in the direct surroundings of the city, once perpetuated by Rembrandt, Van Gooijen, Ruysdael, Monet and Mondriaan in touching paintings, and make it accessible for those who would like to admire it for its sheer beauty or out of cultural interest. In this historic landscape, the IJ-river on the east side of the city plays an important role. In the 17th century the ships loaded with precious goods from the Indies and from all the other parts of the world would approach the city from there, coming from the  now partly impoldered and diked in  inland sea, which in those days was the only access to Amsterdam for ships coming from the North Sea. By giving the new city of Almere on the eastern shore (in one of the polders) its own characteristic appearance and by revitalising the naval itinerary on this arm of the former Southern Sea (Zuiderzee), a vast interurban area is coming into existence, abounding in water, gaining an entirely new meaning. Together with the surrounding suburbs from the 19th century (Almere, Hoofddorp, Nieuw-Vennep, all built on land reclaimed in the 17th, 18th and 19th centuries from lakes sometimes reaching as far as the city walls) Amsterdam forms a great metropolitan area, an almost ideal city which can gain a new impulse by the addition of carefully selected architecture and well balanced urban development. Amsterdam is doing better all the time. It is a city I love because of its romantic side, as well as its small and grand scale - and because of its enormous potential for all. There is no better place to be, or to be mayor of. The mayor of the Dutch capital can point to an enviable record in national and city politics, academia and broadcasting, with plaudits from a range of opinion makers for his inclusive approach to politics and city life. Appointed mayor in 2001, he was named one of Time magazine’s ‘European Heroes’ in 2005. 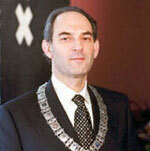 Cohen was born in 1947 in the neighbouring city of Haarlem to liberal Jewish parents. He attended the gymnasium in Haarlem before studying law at the University of Groningen, where he graduated with a law degree in 1971 and married the following year. Aged 20 he joined the PvDA (Labour Party). After graduation, Cohen took up a research position at Leiden University, where he remained until 1981. He then commenced teaching at Maastricht University, becoming professor in 1983 and then rector magnificus in 1991.